The benefits of goat milk are legendary. It has been used for centuries as a luxurious beauty aid. The low PH level of goat milk is close to our skin’s PH, making it a very gentle, soothing, 100% natural skin cleanser and conditioner. Goat milk also contains alpha hydroxyl acids, which are known for their restorative and rejuvenating qualities. Sassy Goat Milk Soap has the benefit of natural glycerin which occurs in the soap making process… commercial soaps have the glycerin removed from them. Sassy Goat Milk Soap products are handmade with fresh 100% LaMancha goat milk from my own herd of goats. Sassy Goat strives to make naturally organic protein rich soaps, shampoos, lotions and lip balms, among other products, that are gentle and help moisturize skin. 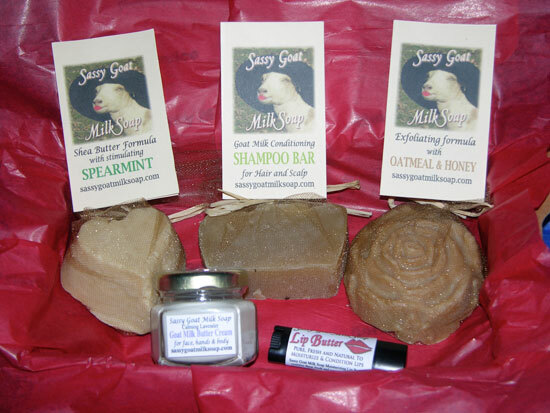 Sassy Goat Milk Soap products are pure and full of vitamins and antioxidants. My Sassy Goats do not receive hormones or antibiotics. They feast on whole grains, fresh hay and lush pastures not treated with pesticides. Sassy Goat Milk Soap makes products that are gentle, even for the driest of skin. Sassy Goat products are made in small, controlled batches promoting a high standard of quality. Only the best ingredients are used in our recipes. Your skin will respond immediately! Sassy Goat Milk Soap handmakes our soaps and other products with the best ingredients for your natural skin care. Listed below are the ingredients for two other popular soaps, one with goat milk and the other for sensitive skin and also unscented. After reviewing these ingredients, which soap would you want to use – Sassy Goat Milk Soap with pure fresh goat milk and wholesome food-grade ingredients, or those other soaps factory made with ingredients you can’t even pronounce!